Bones are funny things. They are a vital part of life, literally supporting us from our first breath onward. But, at the same time, they are a symbol of death and are seen as dirty, unclean, and morbid. Beautiful Bones: Sakurako’s Investigations explores this dichotomy through a series of episodic mysteries. In the forest on the outskirts of a sleepy town lies a mansion. Inside lives Sakurako, a beautiful young woman who is obsessed with bones. Caring little for other people and society in general, she has nonetheless come to befriend a high school boy named Shotaro. After all, whenever the two go out together, they seem destined to come across corpses, and often human ones at that. Most episodes are loosely connected, stand-alone tales focusing not only on the mysteries behind the corpses but on how the still living have been affected by these deaths. Misanthropic main characters in crime and medical dramas are common to say the least. While overly blunt and disdainful of useless emotional outbursts, Sakurako is neither particularly arrogant nor joyless like the common trope. She loves osteology (the study of bones) with an obvious passion that is rivaled only by her love of cakes and other sweets. She simply finds most people uninteresting, which in turn creates the mystery of why she has such an interest in a normal high school boy. The way Sakurako views the world is the most captivating point of the series. Most of us have a natural aversion to death, finding it dirty or disgusting. Sakurako finds death no less beautiful than life. Of course, she understands the difference between the two and treasures life, but at the same time she sees bones as the connecting piece between the living and the dead. She literally surrounds herself with these connections (animal skeletons) in her home. At her core is one simple truth: You don’t stop loving something just because it dies. Therefore, how could bones of something you loved be anything less than beautiful? Even bones of those unrelated to you must be worthy of admiration and respect. Much of Shotaro’s arc is about his coming to understand Sakurako’s way of viewing the world. As the viewpoint character, he represents the viewer to a large degree, acting as any one of us would for the most part. 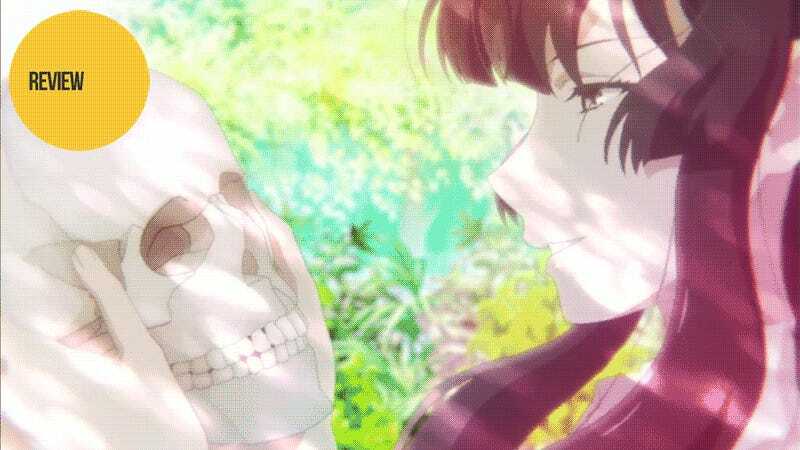 However, he is also self-aware enough to see how being with Sakurako is changing him as he slowly loses his aversion to death and begins to see bones as the wonderful objects they truly are. The other major portion of his development follows his learning to be a detective. To Sakurako, every mystery is nothing more than another of her skeletons, a connection between past and present that, when assembled together properly, tells a story of life and death. With the right “bones” (both literal and metaphorical), it is easy for her to piece together what happened. Shotaro likewise learns to piece together facts in this way in addition to another key truth: that even when put together properly, the truth can be viewed and interpreted in many different ways. The relationship between the two is a complex one. Subconsciously, she represents his escape from a normal boring life. Likewise, part of her sees him as a proxy for her deceased little brother, even as she struggles to keep some emotional distance by referring to him only as “boy.” Their odd friendship is also one of apprentice and master when it comes to both bones and crime-solving. On the other hand, when both are interacting with normal society, their relationship shifts into one of parent and spoiled child, with Shotaro as the parent and Sakurako the child perpetually perturbed at the boundaries he sets. If it wasn’t obvious by now, death is the main theme of Beautiful Bones. As the tagline says, it is “A story dedicated to those trapped by the past.” The other characters, both recurring and one-offs, are “set pieces” to help tell stories that teach about life through death. Some episodes tackle the question of what are you willing to die for? Others look at how various people deal with death, i.e. how they attempt to keep on going and how sometimes they fail. When it comes to the mysteries presented in each episode, some are rife with danger while others focus on how and why certain deaths happened. Some deaths are violent while others are from natural causes. However, the story around each never ceases to be interesting. Yet, while generally episodic, there is an overall story arc to Beautiful Bones. By the end it is revealed that several of the cases Shotaro and Sakurako have investigated are linked. Behind them is a serial killer that uses emotional manipulation to drive people to murder or suicide. These poor, vulnerable people are his murder weapons, killing and thus allowing to claim his serial killer trophies: a bone shaped like a butterfly from within the human skull. Unfortunately, while the existence and identity of the true criminal is revealed by the end, that is the extent of it. He is neither captured nor even pursued by the pair. In fact, he never once comes into contact with Shotaro or Sakurako. Because of this, while the series does reach a logical conclusion point, it feels overall like it’s missing the final few episodes of the anime at least (and a full second season at most). While many anime are plot driven, Beautiful Bones: Sakurako’s Investigations is one of the few that is theme driven, with each episode focused on a different aspect of death, be that the motive behind a murder mystery or simply how people deal with the unexplained loss of a loved one. Sakurako is a complex lead character and an enigma in and of herself that is a pleasure to try to unravel. The series’ only real weakness is that its overarching plot is left dangling. However, in a piece of fiction like this, the story is secondary to what the show as a whole teaches us about ourselves. And through this anime, you too may become able to see the beauty in bones. Beautiful Bones: Sakurako’s Investigations aired on Tokyo MX in Japan. It can be viewed for free and with English subtitles in the US on Crunchyroll.